FAQ: How does shipping work for collapsible tanks? Answer: Thanks for inquiring more about our tanks and our process! We at Portable Tanks, a division of GEI Works, like to make sure you get your tank in a timely manor to almost anywhere! We at Portable Tanks, a division of GEI Works, like to make sure you get the best price in shipping as well as the best price tank. Instead of having a flat shipping rate, we like to know more about your tank so we can find the cheapest and fastest shipping quote available. Many variables are considered when shipping. The size of liquid storage containers can affect the price along with its weight. The more we know about what kind of storage tank you need, the more accurate we can quote your shipping time and cost. Weight can even depend on what material is being used. Two tanks of the same storage capacity may weigh different depending on the fabric being used. 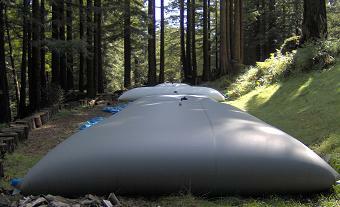 Portable Tanks, a division of GEI Works, is located in the US and we do not have dealers in other countries. We do, however, have no problem shipping worldwide and do so all the time!